Following a really busy spring, we have made a lot of progress, promoting the sport both locally and nationally in France. The squad is also growing with new players, happily, from both Breton and UK origins. We travelled to Rennes(35) twice, firstly to the Expo complex to play Aulnay Walking Football(Dept 17) and the Ligue de Bretagne. BWFA then took on Stade Rennais, comprising a number of ex-pros and supporters, filmed by TF1. The resulting video broadcast has created a really positive response, including the forming of at least one other walking football teams in Brittany – more news of that to follow. We are receiving confirmation bookings for our popular tournament in Cleguerec(56), now extended for 8-9-10-11 September – to provide our visitors an option for an extended stay in Brittany or to take part in a weekday tournament. There will be French teams involved, both from within our region and further afield. If your group can only travel to Brittany outside of these dates, please talk to us with your plans and suggestions. We will be pleased to tell you about our facilities, accomodation and other things to do nearby. After all, we liked it here so much, we moved here! All the Best, John Alexander, Sec. BWFA. Following a record breaking, long BWFA committee today, we have a lot of news and events to work on during the coming months. Firstly, our A.G.M. has been set for Sunday 25th March – after training, at Cleguerec. We are testing a warm hostlery as an alternate venue following the session, in case the need for intensive, liquid recovery is needed. TF1 also want to see us back in action in our own backyard within the rural environs of Cleguerec during April and we are trying to involve the Maire – an ex player himself, the municipality and the local football club in the town. We are now inviting firm interest for our popular tournaments in Cleguerec, planned for 19-20 May and 8-9-10-11 September – to provide our visitors an option for an extended stay in Brittany or to take part in a weekday tournament. We already have on-going contact with friends at Plymouth Argyle, Bristol Utd, Havant & Waterlooville, Fleet, Rothwell Old Boars (great name!) Guernsey, Uxbridge and Portsmouth. A warm welcome awaits in our green and pleasant corner of France. If your group can only travel to Brittany outside of these dates, please talk to us with your plans and suggestions. Our friends from Aulnay (Dept 17) have today invited BWFA to a return visit and competition in mid-June. We have accepted the kind invitation and have already begun making plans for the trip way down to the deep south. Is the local ale any good chaps? (for moderate rehydration purposes, naturally…) The first-aid kit will be supplemented with factor 50 and /or sun hats. JANUARY 2018 NEWSLETTER – Happy New Year, One and All. BWFA has had some quite exceptional publicity recently, particularly since our exhibition evening at Saint-Jean Brevelay. The event was regarded as a great success for the Association. The football was enjoyable, although we were quite outpaced by the regional teenage representative squad. Results aside (they were not good for us!) the later mixing up of all the participating players was really successful and the integration of the ages worked exceptionally well. F.F.F. District 56 arranged the meeting. Local press attended and a subsequent article and video from Agence France Press has widened the awareness of walking football nationally in France and beyond into other French speaking countries, including Belgium, The article brought immediate interest from BFM tv, who want to discuss a potential feature. So, we may be adding “as seen on tv” to our title! French tv giants TF1 and BeIN Sports have also shown interest in our sport and along with our friends in Aulnay (dept 17) we hope that a match can be organised and some action can be televised. We have received various new enquiries from groups and players within Brittany and other areas of France. New players Andrew and Julie, attended our most recent Cleguerec session on 7th January. More newcomers are very welcome to join us! Our network of friendly groups is constantly growing, especially with Aulnay, Guernsey and recently, Rothwell Old Boars in Yorkshire. The more, the merrier. We have been invited to the Salon des Seniors at the Ligue 1, Stade Rennais FC on 6-7 April. It is possible that we will be playing in front of people attending an exhibition created for the middle aged and above at the impressive Roazhon Park football stadium – though probably not on their hallowed turf! The 2018 dates for our popular tournaments in Cleguerec are being planned for 19-20 May and either 1-2 or 8-9 September. We ask that interested groups contact us as soon as possible to enter and for information needed for visiting our green and pleasant corner of France. 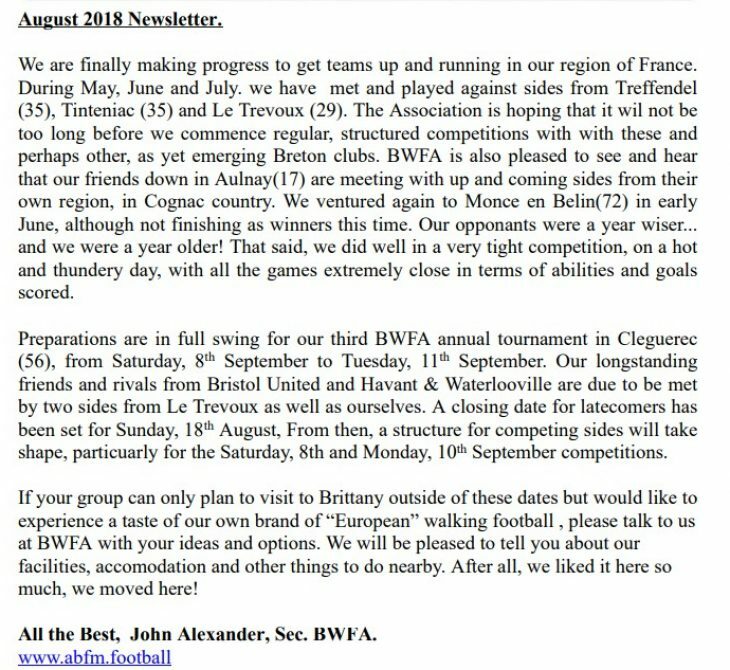 BWFA has revived our Twitter account and our other social media platforms will be improved in the coming weeks., including the website :www.brittanywalkingfootball.weebly.com Our Association AGM will be arranged to take place by the end of March. A team name of “Les Bleus Clairs” has been adopted for our high octane, competition squad, although ” Brittany Spears” has appeared as an alternative with mixed opinions. Our President, Jeff Smith has been in contact with several interested clubs and associations, particularly in Guernsey. They are developing quickly and maybe we can visit them next year and host a return fixture as well. They naturally have close, friendly links to Jersey too. Our relationship with District 56, part of F.F.F. (Fédération Française de Football) has produced an invitation to attend the college at Saint Jean de Brevelay (56) on 14th December, to exhibit the game to students, tutors and parents. AFP (Agence France-Presse) will hopefully attend the presentation! We plan to have a post match-pre Christmas soiree after the fixture, which is timed for 17.15-19.00. We have conducted several other press engagements, including an interview that Jacqueline Dufour held with RMC (Radio Monte Carlo) in Monaco – by telephone, sadly not in person! describing our sport – in all of 5 minutes! The presentation has now been networked nationally. We hope that all the publicity will help broaden awareness in the region in general and in particular, to expand female participation in the Association. In early September, Aulnay (17) attended with a mixed age squad and were able to raise 2 teams. We played outside on a new all-weather court in Cleguerec on a perfect Breton afternoon. A fine evening at Pont Samouel was enjoyed and gifts given. Bad weather, injuries and hangovers dictated that Aulnay departed early the next day. A week later, we hosted Havant & Waterlooville and Bristol United. We enjoyed a very successful tournament and… BWFA won! Jeff commented that it was very pleasing, as president, to award the winning trophy to himself. In October, a group from BWFA attended a tournament in Havant, near Portsmouth. We lost the opening 2 games, but rallied well and won the remaining 3. BWFA finished 3rd, closely behind the runners up. The next day, we were the guests of Pompey in the Community for a competition. Good friends and contacts were made over the two days and we hope to return sooner rather than later. The group intends to continue training and activity over the winter and are planning 2018 tournaments in May and again in September. The group has had a lull in the last few weeks. A summer break perhaps. However, the September tournaments are only a few weeks off and we are keen to start up some pre-season action. Sunday, 13th August, 11.00 am And Monday 14th August, 18.00pm. Please respond on Facebook if you can make either or both so we can prepare accordingly. I am sure most know now of our successful efforts in the hot and sunny Sarthe 72. on June 10th. Whilst ultimately victorious, it was a hard, long day with just 6 of us. The moral of the day is that it has to be a squad game. Monce en Belin welcomed us with friendship and we hope return their hospitality in Cleguerec for the first of our competitions in September. Our first BWFA quiz was a great success. over a dozen teams of four contestants had an entertaining evening in Silfiac. Jill and Phil kept firm order while keeping the quizsters fed and watered. We hope to hold another quiz in the new year. Our first tournament on Saturday/Sunday 2/3rd September is taking shape. We are planning on a four team competition including Monce en Belin and a team from Aulnay in Dept 17. Monday/Tuesday 10/11 September. Teams from H&W, Bristol City confirmed. Also, possibly Cleguerec FC and/or a second BWFA team. All options for the playing surface are possible. The new all weather outdoor court is now completed in the Cleguerec sports ground area. All shiney new and with a lush, synthetic grass surface. The last few weeks have seen several training sessions affected by the bank holidays, venue unavailability and alternative commitments of our members. Alex at Pedernec has had additional issues with bad weather, road closures and injury to contend with. We hope Robert in Huelgoat presses on with raising interest in Finistere. Jon has encouraged new members into Josselin, but has also been affected by poor weather. 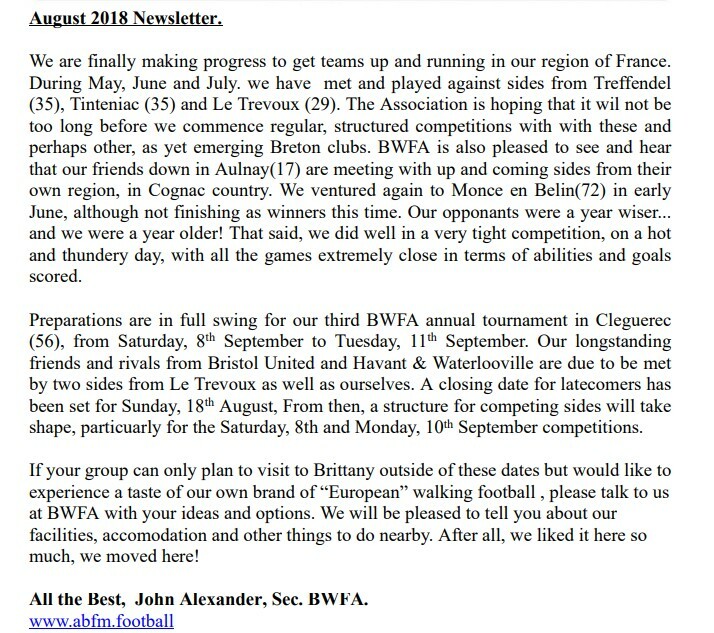 BWFA has received interest from groups outside Brittany, in Monce en Belin 72 and Aulnay 17. Also recently, from Nice & Marseille. Our exhibition debut at Rennes Expo in March was well received and we hope our relations with the Ligue de Bretagne will grow over time. Sadly, we could not participate at Bristol City in April, we will try again next year to take a team to support our friends at Ashton Gate. Phil Volz and Ian Malpass travelled to Havant & Waterlooville to participate in their April tournament. They gained valuable experience in the quite intense, but well organised two hours of action, comprising 5 matches each for the 6 teams. Team tactics were a particular feature of the participants from H&W, Portsmouth, Southampton, Fleet, Hayling and Alton. Saturday, 10th June, invitation from Monce en Belin 72, near Le Mans, to play in an event with 4 local teams. We sent a team of six + two vital supporters (Carol & Tina) and despite hot sunshine , a large grass pitch and stiff opposition ranging from very good juniors through to experienced senior players, drew two and won two to win the tournament. Jeff, Phil Ian, Brian, Keith and John comprised the triumphant team. Saturday/Sunday 24/25th June. Josselin 56. Breizh British weekend. Demonstration event on Saturday afternoon. More details to follow. Saturday/Sunday 2/3rd September. Cleguerec tournament. Work in progress, Teams from Uxbridge and possibly Fleet at least at this stage. We hope to use a NEW enclosed outdoor “grass” court in Cleguerec. Monday/Tuesday 10/11 September. Cleguerec tournament. Work in progress. Teams from H&W, Bristol City confirmed. Also, possibly Ligue de Bretagne, Aulnay and Monce en Belin as well. Silfiac 56480 (Between Cleguerec and Gouarec). We offer a bar with wine – beer – soft drinks and table top nibbles / snacks. Team entry fee of Eur 5.00 per person (max 4 people per team) with assorted prizes. We offer a free welcome drink to help celebrate our victory in Le Mans.